CHEAC invites you as key partners to submit workshop abstracts should you wish to host a workshop sessions. Roughly 15 workshops will be hosted between 10:00 am and 4:00 pm on Wednesday, October 9 and Thursday, October 10. Those interested in submitting a workshop abstract can find additional information on our CHEAC website here. Please note abstract proposals are due to CHEAC by COB Friday, March 29. On Thursday, the Senate Budget & Fiscal Review Subcommittee No. 3 on Health and Human Services convened to hear items under the Department of Managed Health Care (DMHC) and the Department of Health Care Services (DHCS). Of the 25 more frequently prescribed drugs, enrollees paid roughly 3 percent of the cost of specialty drugs and 56.6 percent of the cost of generics. Individual Mandate and State Subsidy Program. The Department of Finance (DoF) presented the Governor’s proposals to institute a state individual mandate and a new state subsidy program and noted that the related trailer bill language had been posted earlier that morning. DoF noted their proposal is modeled closely after federal law and would be administered by the Franchise Tax Board in coordination with Covered California and DMHC. The penalty would be based on income and family size, while maintaining the federal exemptions as codified today. Further the individual mandate would be automatically adjusted should the federal government reinstate the federal penalty associated with the individual mandate and would be deposited into the General Fund. The new state subsidy proposal would be the first in the nation to cover middle income consumers and would be available to individuals with incomes within 250 to 400 percent of the federal poverty limit (62,000 – 140,000 for a family of four). Subsidies would be subject to annual GF appropriation, be administered by Covered California and provide advanced premium assistance. The subsidy program would sunset December 31, 2022, allowing the federal government time to revisit and address the affordability challenges with the current structure of the ACA. DoF noted the subsidy program closely mirrors the federal framework in place today and must closely mirror the penalties received from the individual mandate, which is estimated at $500 million and will be updated in the May Revise. Legislators expressed a myriad of concerns around the subsidies being dependent on revenues received from the individual penalty. Key concerns included the risk of individuals having subsidies that vary year to year and the potential for the penalty estimates adopted in June to not be fully realized, meaning there would not be enough revenue generated to cover the costs of subsidies provided. The Administration reiterated the structure being closely mirrored to the federal framework, but noted the Legislatures concerns and agreed to take them back for consideration. Medi-Cal Expansion to Undocumented Young Adults and AB 85 changes. DHCS presented the Governor’s proposal to expand full-scope Medi-Cal to undocumented young adults ages 19 to 25. The department estimates approximately 138,000 additional individuals would receive coverage under this proposal with a cost of $194 million General Fund and $63 million federal funds (accounting for the emergency and pregnancy services eligible for FFP). DoF presented the Administration’s proposed changes to AB 85 under the assumption of reduced costs to counties. They noted the increased redirection from 60 percent to 75 percent for the County Medical Services Program and key other counties (Placer, Sacramento, Santa Barbara, Stanislaus, and Yolo) would result in an additional diversion of $63 million. DoF indicated they are aware of county concerns and would be further exploring how money is spent between indigent health and public health services and assessing county feedback. Peter Beilenson, Director of the Sacramento County Department of Health Services, underscored the impacts to his county including reductions to public health services and services to serve the remaining uninsured. He noted the proposal would result in an additional loss of $7.5 million of health realignment revenues for Sacramento County. In addition, he shared that of roughly 4,000 undocumented individuals the county serves, only 2.5 percent are within the 19-25 age range. Health Access also expressed concerns with redirecting funding away from counties that would hinder our ability to provide services to the remaining uninsured and core public health functions. They indicated any new formula would need to account for actual savings and ensure the continued provision of these services. Senator Pan conveyed concerns about the ability for counties to carry out core duties considering a greater claw back of realignment from the State. He talked about key public health issues – outbreaks and STD rates – and how this proposal would harm the resources of local health departments to address them. Amid the concerns expressed, Senator Pan questioned whether this pot – health realignment – is the right pot of money to fund the expansion. During public comment, several advocates testified in support of the expansion of Medi-Cal to young adults and urged the Legislature to broaden the eligibility to all undocumented individuals that otherwise would be eligible for Medi-Cal. Michelle Gibbons expressed CHEAC’s opposition to increasing the share of realignment that would be diverted from counties and the adverse impacts to key jurisdictions. Managed Care Organization (MCO) Tax. DHCS provided more detail around the rationale for not including a proposal to renew the MCO tax in the Governor’s January budget, despite the current MCO tax offsetting roughly $1.3 billion in General Fund costs. DHCS indicated that since 2016 only two states have gained an approved MCO tax. The department also factored in the change in federal administration and other requests California would be seeking, such as waiver renewals. The Legislative Analyst’s Office (LAO) agreed that there is uncertainty around the approval of an MCO tax but noted that Michigan’s recently approved tax is similar to California’s. In addition, the LAO mentioned that revenues generated through the MCO tax exceed that of the waivers up for renewal and suggested it was worth California pursuing. The Robert Wood Johnson Foundation (RWJF) and the University of Wisconsin Population Health Institute this week released the 2019 County Health Rankings & Roadmap Report, which assesses the health status of all counties in the United States. The Rankings help counties understand what influences how healthy residents are and how long they will live. By examining a wide variety of measures that impact the health of communities, including high school graduation rates, access to healthy foods, rates of smoking, obesity, and teen births, the Rankings allow counties to garner support for local health improvement initiatives and activities. The Rankings detail potential effective approaches to improve county health in the report, such as facilitating access to resources needed to secure affordable housing, providing services and supports to increase housing stability and reduce the risk of homelessness, and making communities more inclusive and connected. Additional information on the Rankings, including how your jurisdiction ranks, is available from RWJF here. The Insure the Uninsured Project (ITUP) released a 2019 update to their report on county medically indigent programs (MIA) on Thursday. This report is intended to provide an overview, background, and history of county MIA programs, as well as financing and current challenges with programs. Included in this year’s update is a conclusion that county MIA programs largest enrollment numbers consist of individuals at or above 300% FPL and low-income undocumented adults. The full report, which provides county-by-county MIA information, can be found here. This week, the Insure the Uninsured Project (ITUP) published two major briefs on the future of health reform in California: “Mapping the Future of Medi-Cal” and “Mapping the Future of Individual Health Insurance.” Both reports offer basic background information and focus on significant upcoming issues likely to engage policymakers and stakeholders over the coming years. The Medi-Cal report discusses federal financing and waiver issues, as well as other program design issues. The individual health insurance report covers federal threats to the Affordable Care Act (ACA) and affordability and access issues. Both reports come on the heels of the 2019 ITUP Conference held in Sacramento in February, which featured extensive discussions and expert presentations on these topics. 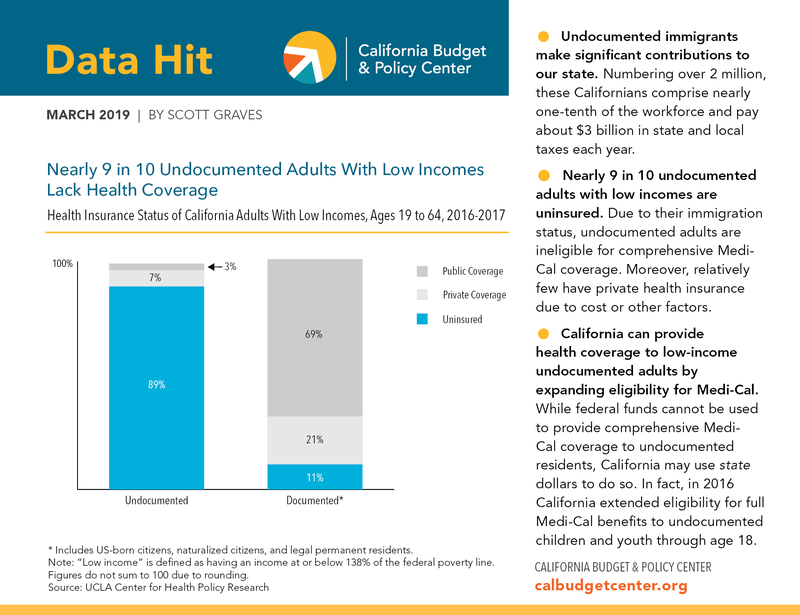 The California Budget & Policy Center (CBPC) this week released a data brief on undocumented California adults and health coverage, finding that nearly nine in 10 undocumented adults with low incomes lack coverage. Only approximately three percent of undocumented low-income adults had public coverage and approximately seven percent had private coverage; the remaining approximately 89 percent had no coverage. As discussed in the data brief, while federal funds cannot be used to provide comprehensive Medi-Cal coverage to undocumented residents, California may opt to use state funds to expand coverage to this particular demographic group. The full data brief is available here. This week, the National Association of County and City Health Officials (NACCHO) launched a new online resource entitled “Opioid Epidemic Toolkit for Local Health Departments.” NACCO is collecting resources to support local opioid overdose prevention and response efforts as part of the U.S. Centers for Disease Control and Prevention (CDC)-funded Local Opioid Overdose Prevention and Response (LOOPR) Project. The project is designed to provide local evidence-based strategies and increase the capacity of local health departments to effectively respond to the nationwide opioid epidemic by working more closely with state and local partners, including law enforcement, healthcare providers, and local and state health departments. The full NACCHO opioid epidemic toolkit is available here. On Wednesday, the National Academies of Sciences, Engineering, and Medicine (NASEM) issued a report on opioid use disorder (OUD) treatment options, finding that despite the fact that the three U.S. Food and Drug Administration (FDA)-approved medications are safe and effective, most individuals who could benefit from the treatments do not receive them. Further, the report determines that access to OUD medications is inequitable, particularly among certain subpopulations. A fragmented system of care for people with OUD and current financing and payment processes. NASEM discusses in its report the current state of treatment access, finding that adolescents and young adults, people in rural areas, and racial and ethnic minorities are disproportionately impacted by access challenges. The report goes on to further examine overall effectiveness of medication treatment, population-specific considerations, and treatment setting challenges. The full NASEM report is available here.